Chapulines, plural for chapulín ( tʃapu'lin ), are grasshoppers of the genus Sphenarium, that are commonly eaten in certain areas of Mexico. 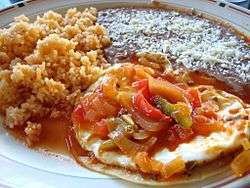 The term is specific to Mexico and Central America, and derives from the Nahuatl word chapolin [t͡ʃaˈpolin] (singular) or chapolimeh [t͡ʃapoˈlimeʔ] (plural). They are collected only at certain times of year (from their hatching in early May through the late summer/early autumn). After being thoroughly cleaned and washed, they are toasted on a comal (clay cooking surface) with garlic, lime juice and salt containing extract of agave worms, lending a sour-spicy-salty taste to the finished product. Sometimes the grasshoppers are also toasted with chili, although it can be used to cover up for stale chapulines. 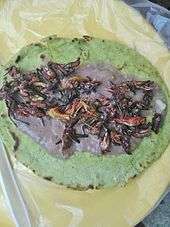 One of the regions of Mexico where chapulines are most widely consumed is Oaxaca, where they are sold as snacks at local sports events and are becoming revived among foodies. There is one reference to grasshoppers that are eaten in early records of the Spanish conquest, in early to mid 16th century. 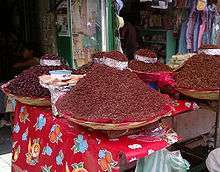 Besides Oaxaca, chapulines are popular in areas surrounding Mexico City, such as Tepoztlán, Cuernavaca and Puebla. They may be eaten individually as a botana (snack) or as a filling, e.g. tlayuda filled with chapulines. In 2007, several American media reported concerns over lead contamination in products imported from Zimatlán, a municipality in Oaxaca, including chapulines. In California, an investigation among community residents in Monterey County showed a larger risk for lead poisoning on people who either were from or reported eating food imported from Zimatlán. Contaminated chapulines which were found for sale in California were also identified in samples from Zimatlán. Lead levels found in the chapulines were as high as 300 times the maximum recommended lead dose for children under the age of 6 and pregnant women. ↑ "Chapulines and Food Choices in Rural Oaxaca". Jeffrey H. Cohen, Nydia Delhi Mata Sanchez and Francisco Montiel-Ishino. Gastronomica. Vol (90)1: 61-65, 2009.